Rosaria Conte has been the founder and head of the Laboratory of Agent Based Social Simulation (LABSS) within the Institute of Cognitive Sciences and Technologies at the Italian National Research Council (ISTC-CNR). She has also been Vice President of the Scientific Council of CNR and head of the CNR Project “Society, Culture, Globalization” (ICP08). She was a cognitive and social scientist, with a special interest for the study of positive social action (altruism, cooperation and social norms), and reputation-based social regulation. Quite active in the MAS field, she contributed to launch the field of social simulation in Europe. She has been coordinator of both European and Italian research projects. She has been involved in the FP7 FuturICT Flagship Project. She was President of the European Society of Social Simulation (ESSA), coordinating the section on Special Interest Groups, and of the Italian Cognitive Science Association (AISC). 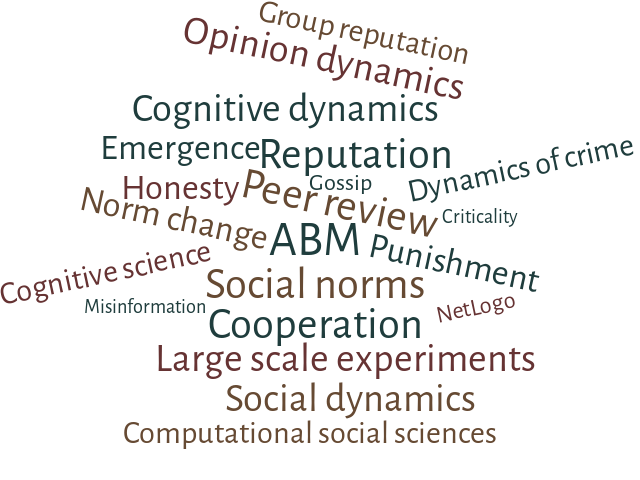 Rosaria has published about 160 among scientific articles and books on cognitive social agents, norms representation and reasoning, and agent-based simulation. Her research interests range from Agent Theory to Multi Agent Systems, from Agent-Based Social Simulation and Cultural Evolution to Info-societies and Virtual Markets.